When you first step into Camp David be prepared to "whoa!" It's spacious, full of windows, and the midcentury-inspired design was dubbed by Harper's Bazaar as the "chicest workspace you've ever seen." But more importantly, founded in 2017 and part of the blooming community bringing back Industry City, Camp David is home to a hive of small businesses, several inspiring makerspaces, and a cool cafe to hang out in. 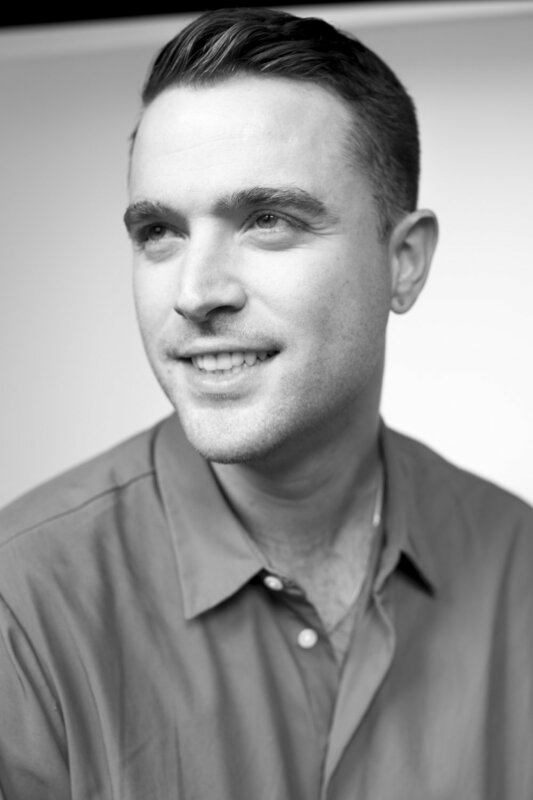 We spoke with Joey, Camp David's Director of Membership, to learn about the community and what's next for the space. How did Camp David start? We love the reference in the name. 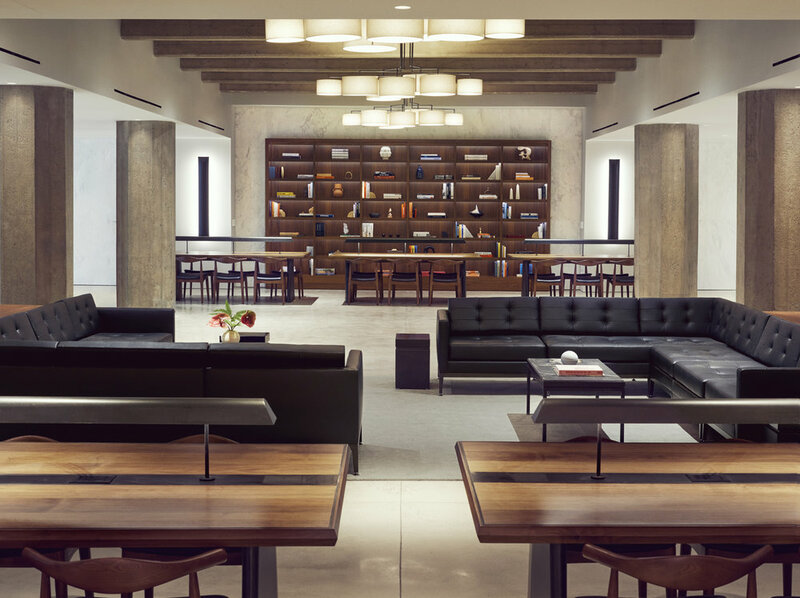 So Camp David was founded by Milk Studios co-founders Mazdack Rassi and Erez Shternlicht with the vision of creating the ultimate workspace escape from Manhattan. As our original namesake was always intended to be for the White House, Camp David is a refuge where the real work can get done without big city distractions. It's a 20 minute subway ride from Union Square! We created a beautiful workspace, somewhere where we ourselves would actually like to work. From the custom furnishings to the soundproofed office spaces, it is truly coworking for grown-ups. How would you describe the community at Camp David? The professional community at Camp David is totally diverse. Originally we thought we’d attract mostly creative professionals from the surrounding neighborhoods, but not only do we have those architects and designer-types but also real estate professionals, tech companies and lawyers. Also a large portion of our membership base commutes from Manhattan, as it’s proving that the reverse commute makes for a much more pleasant daily routine. I love that even some of our seemingly “non-creative type” members are able to use Camp David’s creative amenities. From a lawyer who frequents our textile studio to work on shirt designs, to tech engineers who produce a full-day product photoshoot in our photo suite. Our members have truly been able to use Camp David as a membership space, not just a 9-5 office. The design for Camp David is gorgeous. What directed a lot of the style perspective? Much of the interior of Camp David is a throwback mid-century modern offices + the institutional building heyday of the 50’s and 60’s. In fact one main inspiration is the Mies van der Rohe designed Crown Hall at the Illinois Institute of Technology. 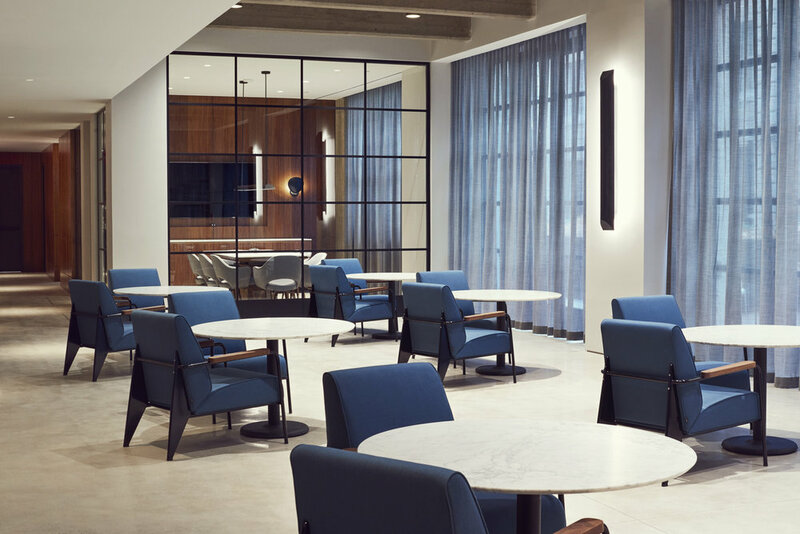 A really cool aspect of the design is that we had to rethink and adapt a 100-something year old structure in Industry City into a completely new and beautiful work environment. There’s a touch of brutalism with the original concrete support beams and ceilings, but then a high-end feel with custom tables and Jean Prouvé + Hans Wegner seating. One of my favorite bits is the extinct pine hardwood flooring on our Private Office level. As you walk along the corridors you’ll see random splotches and pools of blue, red and green ink stains embedded in the wood. We believe these to be from a former textile or printing company tenant that occupied that floor in the past 100 years. We love the photo studio and textile space that Camp David provides. Tell us more about some of the projects or productions you’ve seen come alive here. We love the various ways that those creative spaces are getting used. Members have been utilizing the soundproofed studios for podcasting, sound design recording, live video blogging, etc. We’ve even had a number of TV/film shoots go down like one member who shot an E! Fashion News segment. Other than daily shoots, we have designers using the industrial sewing machines, architects building out scale models in our prototyping space, even product companies reworking package designs. The fact that we have flexible creative work space really encourages members to get out of their offices and get a little messy. What are some favorite spots around Industry City? Industry City has tons of hang out spots and programming activities, let alone it’s very own food hall boasts over 20 various food vendors. Of course I’m a little biased by my favorite place to eat and hang is at The Camp David Café, which is run by our partners Peaches NYC. Based in Middle Eastern and Italian cuisines our café is my daily go-to for all things breakfast and lunch at IC. Also one of my absolute favorite things about IC is the fact that it’s in Sunset Park. Within a 5-min walk you’ll find some of the best tacos in the city (if not THE best) at Tacos El Bronco on 4th ave or the best tortas at Don Pepe’s on 5th. Happy Hour favorites would have to be frozen margaritas in the garden at Maria’s on 5th ave or hitting up one of my fav bars in NYC, the bar at Melody Lanes bowling Alley…seriously it’s a delightful place to drink whether you’re bowling or not. Lastly I can’t talk about Sunset Park without shouting out the massive Chinatown that stretches along 8th ave. You’ll find one of the most legit dim sum spots at Pacificana and another personal favorite is the always packed Mr. Hotpot. Any new features, events, or things to look forward to from Camp David? Yes! We have really wonderful member programming on the horizon with some awesome partner companies like Working Not Working, The CFDA, Hush Agency, and NY Artificial Intelligence to name a few. These events will range from panels, live podcast recordings, and screenings to more hands on creative workshops. We’re also seriously hitting the ground running this fall with regular member events like creative learning breakfasts, activity based happy hours, maybe even a Halloween tour of Greenwood Cemetery. What's a fun fact about Camp David? We have over 62 live plants at Camp David!